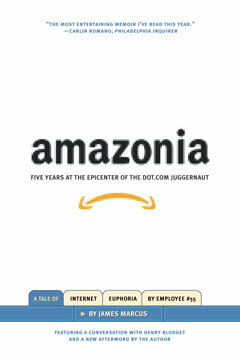 In a book that Ian Frazier has called “a fascinating and sometimes hair-raising morality tale from deep inside the Internet boom,” James Marcus, hired by Amazon.com in 1996, when the company was so small his e-mail address could be james@amazon.com, looks back a decade later at the ecstatic rise, dramatic fall, and remarkable comeback of the consummate symbol of late 1990s America. Observing “how it was to be in the right place (Seattle) at the right time (the 90s)” (Chicago Reader), Marcus offers a ringside seat on everything from his first interview with Jeff Bezos to the company’s bizarre, Nordic-style retreats, creating what Jonathan Raban calls “an utterly beguiling book.” For this edition, Marcus has added a new afterword with further reflections on his Amazon experience. In the tradition of the most noteworthy and entertaining memoirs of recent years, Marcus offers us a modern-day fable, “a clear-eyed, first-person account, rife with digressions on the larger cultural meaning throughout” (Henry Alford, Newsday).